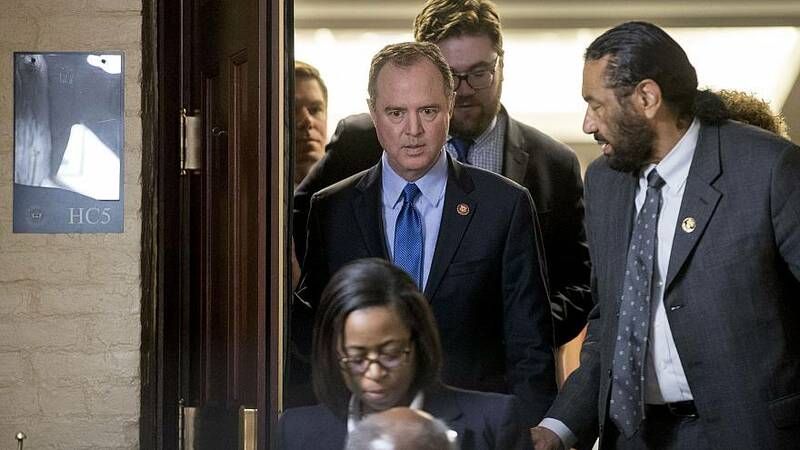 All of the Republican members of the House Intelligence Committee have signed a letter calling for the panel's chairman, Democratic Rep. Adam Schiff, to step down, citing his claims that there was evidence that President Donald Trump's campaign colluded with the Russians during the 2016 race. Rep. Mike Conaway, R-Texas, introduced the letter during a public committee hearing on Thursday. Schiff then defended himself. The California lawmaker, who had long been one of the loudest Democratic voices on the issue of Russian interference, has been a target of Republicans in the days since Special Counsel Robert Mueller's investigation ended. Trump himself tweeted earlier Thursday that Schiff "should be forced to resign" from Congress and said he "spent two years knowingly and unlawfully lying and leaking." Earlier this week, House Minority Leader Kevin McCarthy, R-Calif, Trump adviser Kellyanne Conway and numerous GOP lawmakers called on Schiff to resign as chairman for having claimed there was "more than circumstantial" evidence that Trump's presidential campaign conspired with the Kremlin in an effort to win the 2016 presidential election. According to a summary of Mueller's long-awaited findings by Attorney General William Barr, released Sunday, there was no coordination or conspiracy between Trump, his campaign and the Russian government. Throughout the Mueller probe, Schiff had repeatedly suggesting more incriminating information would emerge from the investigations into the Trump campaign. "I can tell you that the case is more than that and I can't go into the particulars, but there ismore than circumstantial evidence now," he told Chuck Todd on MSNBC's "Meet the Press Daily" in March of 2017.